Overview: Rechargeable, state of the art 3100mAh built-in battery effectively provides well over a 150% charge to your iPhone 6 to last you the entire day. Only compatible with the 4.7 inch model. Apple MFI Certified Chip is approved to work with all functions of your iPhone 6. Full compatible support with iOS 8+ and Apple Pay. Ultra slim hard shell encasing provides 360° scratch-guard protection features an easy-to-install. The BX140 has gone through extensive testing for quality assurance. In an effort to make the case as slim as possible, we have designed the case to be flush with the screen. We've included a high quality screen protector for added screen protection. Easily insert your iPhone 6 into the lightning output port. The battery case uses a MicroUSB input port to enable power and data transfer. You can conveniently charge and sync both the battery case and iPhone to your Macbook, PC or Laptop without having to remove the case itself. A microUSB cable is included. Package Contents (Retail Packaging): 1x battery case, 1x standard bumper, 1x accent bumper, 1x headphone adapter cable, 1x microUSB cable, 1x screen protector, 1x user manual and 1x warranty card. 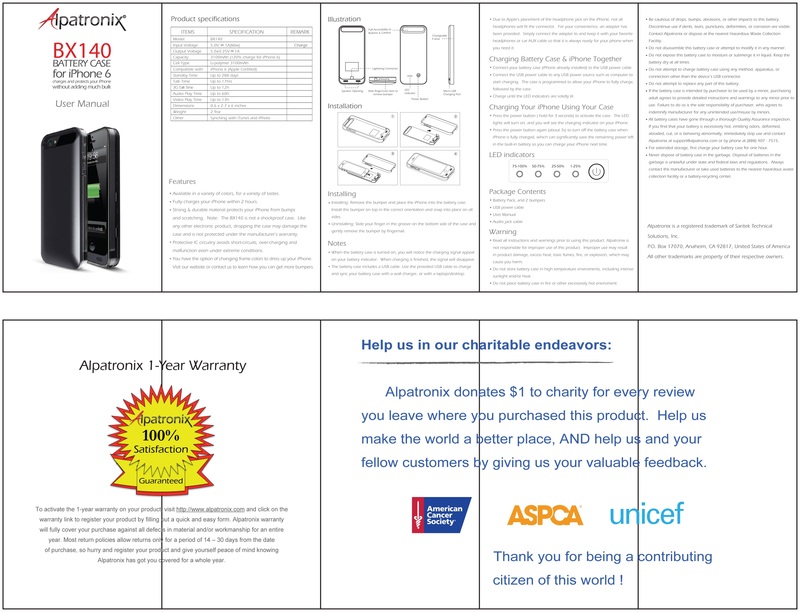 Warranty: Alpatronix products come with an exclusive limited 1-year warranty and 100% customer satisfaction guarantee. Alpatronix Limited Warranty is only available when you purchase your product from authorized Alpatronix sellers. Alpatronix Limited Warranty is only available when you purchase your product from authorized Alpatronix sellers. If you are unsure whether you are purchasing from an authorized supplier, please contact Alpatronix for more information. Click here for full details of our warranty terms and conditions. Standard microUSB cable (can be used for data transfer for iOS and PC compatible devices such as Macbooks and Laptops to sync music and files to iTunes).